aStatistically significant at P < .05 compared with institution C.
aStatistically significant at P < .05 compared with the other 2 institutions. User Guide for the Participant Use Data File. American College of Surgeons National Surgical Quality Improvement Program. https://www.facs.org/quality-programs/acs-nsqip/program-specifics/participant-use. Modified December 1, 2013. Accessed January 15, 2015. Although there is a lack of any meta-analysis or systemic review on this topic couple of studies exists in literature which evaluates the current pieces of evidence for the importance and application of intraoperative bile culture (IBC) during PD. To better understand the role of IBC and extrapolating it results to select proper prophylactic antibiotic, we have analysed and summarized existing literature while highlighting key issues as postoperative wound infection rate, wound culture & resistance pattern, intraoperative biliary culture, type of antibiotic prophylaxis and preoperative biliary stenting (PBS). The reported incidence of wound infection following PD in various studies exists between 8.2% to 29% (2). The bacteriobilia is an important determining factor behind the increased postoperative wound infection. It is frequently encountered following preoperative endoscopic stent placement, which is a widely performed despite evidence based limitations in indications (3–5). Sourrouille et al., have done a prospective study over 175 patients and have reported positive bile culture in 81% cases (6). Similarly, a study by Gavazzi et al., have reported bacteriobilia in 58.9% patients following preoperative biliary drainage (PBD) before PD. The reported incidence of SSI in PBD group was 20.8% (7). The study by Fong et al., further reinforces the difficulties faced by clinicians in the perioperative period following PD and presents some interesting findings, some of which have already been described by others. They have reported wound infection in 8.2% cases of which 67.1% were a deep-tissue infection; bacteriobilia has seen 98.8% patients with preoperative stenting. The bacteriobilia was associated with higher rate of postoperative wound infection (12.4% vs. 5.3%) than in patients without it (8). Realizing the importance of these factors we totally agree with the report that the increase incidence of surgical site infection is secondary to bacteriobilia which are predisposed by preoperative biliary stenting in patient undergoing PD. Furthermore, as the bacteria grown in wound culture resemble that of bacteriobilia. A practice to routinely obtain bile culture during PD would be a nice approach to tailor antibiotics in the presence of pending wound culture report. As this is the protocol we are following in our practice after our study by Limongelli et al., 2007 over 220 patients. In this report, we have reported 29% incidence of wound infection of which 69% were noticed in cases with active IBC after preoperative biliary drainage (9). There is no doubt that this prospective study by Fong et al., has further added to our understanding regarding management of patients following PD, and thus we are grateful to them for their efforts, however, few points deserve mention (8). First, is that the inclusion of data from institution B is non-descript as they had not performed any IBC. They have only reported the results of wound culture which show St. aureus (43.9%) and K. pneumoniae. It is important to know the stand of various studies done to assess the prevalence of microorganisms in bile in cases of obstructive jaundice. In a separate study by Neve et al., and Michael et al., have reported prevalence of St. aureus as 8.3% and 0.03% respectively (10,11). This, in turn, frames some bias in the study by Fong et al., which should be cleared. The second point in the panel of this commentary is the data produced by institution ‘C’. They have reported similar pattern of predominant organism in intraoperative bile and wound culture as E.faecalis (44.8%), K. pneumoniae (23.9%), E.coli (19.4%) and E.faecalis (36.2%), E.coli (36.2%) respectively. As the most prevalent organisms are of enterobacteriaceae group in almost all other studies too. We put forward a thought to check resistance pattern against 3rd generation cephalosporin as ceftriaxone or cefoperazone while IBC as they could be an antibiotic of consideration in cases of bacteriobilia. Over and above that the resistance pattern in this group had shown the high incidence for Methicilin Resistance St. aureus (MRSA) that should be taken care off (8). The third salient point to mention is the comment of Fong et al., referencing the study by Donald et al., over 140 PD where they have first analyzed wound cultures in 34 patients only, which showed cefoxitin-resistant E. faecalis and E. cloacae. Based ¬¬¬¬on the resistance pattern they tailored prophylaxis to piperacillin-tazobactam in the next group of 106 patients, which manifested in the form of reduction of wound infection rates from 32.4% to 6.6%. However, apart from the bacterial resistance, the reported serum albumin level was significantly lower in higher disease group (12). Here we like to quote a prospective study by Harvard Medical School in Boston involving 550 pancreatic resections. Where they have reported that 14% patients had postoperative wound infection of these 20% arose from preoperative biliary drainage. They have also outlined the negative impact of lower serum albumin on wound infection following PD (13). Considering this fact that the Surgical Care Improvement Project (SCIP) was initiated to reduce the preventable surgical complications as SSI. Unfortunately, they haven’t laid any guidelines regarding the use of prophylactic antibiotics against biliary pathogens for PD (14). We do advocate the need of development of prophylactic antibiotic protocol based on intraoperative bile culture and institutional resistance pattern at the same time we do emphasize the role of other factors in the development of these complications. In a retrospective study by Suguira et al., involving 408 patients a total of 51 % patients developed SSI following PD. Here they have delineated various risk factors associated with SSI following PD. The strongest risk factor is pancreatic fistula whereas operative time, main pancreatic duct diameter =<3mm, abdominal wall fat thickness >10mm were other notable ones (5). Ceppa et al., had developed a questionnaire based on various risk factors as surgical technique, wound protection, antibiotics, drain management, glycaemic control, temperature control, blood transfusion, bowel management, oxygenation. They have reported a significant decrease in the SSI incidence from 24.5% to 17.1% (15). We should not underestimate these points which give us more insight for the better management of post PD patients. An another important factor is the duration of prophylactic antibiotic coverage; this was well dealt in a study by Fathi et al. They have evaluated the effect of tailored prophylactic broad spectrum antibiotic coverage for 72 hrs has significantly decreased the infectious complications of PD. Moreover, they have reported no significant increase in the incidence of Clostridium difficile colitis against routine coverage of 24 hrs (16). Some might argue that this is stretching a point, but we like to make a heavyweight appeal to consider all the factors laid in various studies as we think that controlling these factor provides helpful ballast in minimizing SSI post PD. In view of high risk of infectious complication, we contemplate a judicious use of biliary stenting could be a probable answer for prevention of these SSI (17). We do believe in the strength of the recommendation given by Fong et al. and others, but there should be a note of caution as going up in the ladder of newer antibiotics, will make the postoperative crisis worse, not better. Having said that, we are more concerned about a return to the scene of complete resistance like MRSA where they have almost won the knockout stage against many antibiotics. As going up on the ladder of higher antibiotics, the scale will be a self-inflicted risk that is out of our control that we just don’t know how hard it will hit on the future patient’s recovery. 1. Schmidt CM, Powell ES, Yiannoutsos CT, Howard TJ, Wiebke E a, Wiesenauer C a, et al. Pancreaticoduodenectomy: a 20-year experience in 516 patients. Arch Surg. 2004;139(7):718–25; discussion 725–7. 2. Povoski S, Karpeh M, Conlon K, Blumgart L, Brennan M. Association of preoperative biliary drainage with postoperative outcome following pancreaticoduodenectomy. Ann Surg. 1999;230(2):131–42. 3. Jethwa P, Breuning E, Bhati C, Buckles J, Mirza D, Bramhall S. The microbiological impact of pre-operative biliary drainage on patients undergoing hepato-biliary-pancreatic (HPB) surgery. Aliment Pharmacol Ther. 2007;25(10):1175–80. 4. Su Z, Koga R, Saiura A, Natori T, Yamaguchi T, Yamamoto J. Factors influencing infectious complications after pancreatoduodenectomy. J Hepatobiliary Pancreat Sci. 2010;17(2):174–9. 5. Sugiura T, Uesaka K, Ohmagari N, Kanemoto H, Mizuno T. Risk factor of surgical site infection after pancreaticoduodenectomy. World J Surg. 2012;36(12):2888–94. 6. Sourrouille I, Gaujoux S, Lacave G, Bert F, Dokmak S, Belghiti J, et al. Five days of postoperative antimicrobial therapy decreases infectious complications following pancreaticoduodenectomy in patients at risk for bile contamination. HPB. 2013;15(6):473–80. 7. Gavazzi F, Ridolfi C, Capretti G, Angiolini MR, Morelli P, Casari E, et al. Role of preoperative biliary stents, bile contamination and antibiotic prophylaxis in surgical site infections after pancreaticoduodenectomy. BMC Gastroenterol [Internet]. 2016;16(1):43. 9. Limongelli P, Pai M, Bansi D, Thiallinagram A, Tait P, Jackson J, et al. Correlation between preoperative biliary drainage, bile duct contamination, and postoperative outcomes for pancreatic surgery. Surgery. 2007;142(3):313–8. 10. Rakesh N, Sanjay B, Vinay D, Mohandas KM, Rohini K, Parul S, et al. Bile cultures and sensitivity patterns in malignant obstructive jaundice. Indian J Gastroenterol. 2003;22:16–8. 11. Englesbe MJ, Dawes LG. Resistant pathogens in biliary obstruction: importance of cultures to guide antibiotic therapy. HPB (Oxford) [Internet]. 2005;7(2):144–8. 12. Donald GW, Sunjaya D, Lu X, Chen F, Clerkin B, Eibl G, et al. Perioperative antibiotics for surgical site infection in pancreaticoduodenectomy: Does the SCIP-approved regimen provide adequate coverage? Surg (United States). 2013;154(2):190–6. 13. Mohammed S, Evans C, Vanburen G, Hodges SE, Silberfein E, Artinyan A, et al. Treatment of bacteriobilia decreases wound infection rates after pancreaticoduodenectomy. HPB. 2014;16(6):592–8. 14. Bratzler DW, Dellinger EP, Olsen KM, Perl TM, Auwaerter PG, Bolon MK, et al. Clinical practice guidelines for antimicrobial prophylaxis in surgery. Am J Health Syst Pharm [Internet]. 2013;70(1):195–283. 15. Ceppa EP, Pitt HA, House MG, Kilbane EM, Nakeeb A, Schmidt CM, et al. Reducing surgical site infections in hepatopancreatobiliary surgery. HPB. 2013;15(5):384–91. 16. Amir H. Fathi, Terence Jackson, Mehdi Barati, Babak Eghbalieh, Kelly A. Siegel and CTS. Extended Perioperative Antibiotic Coverage in Conjunction with Intraoperative Bile Cultures Decreases Infectious Complications after Pancreaticoduodenectomy. HPB Surg. 2016;2016. 17. Bonin EA, Baron TH. Preoperative biliary stents in pancreatic cancer. J Hepatobiliary Pancreat Sci. 2011;18(5):621–9. Importance Wound infections after pancreaticoduodenectomy (PD) are common. The standard antibiotic prophylaxis given to prevent the infections is often a cephalosporin. However, this decision is rarely guided by microbiology data pertinent to PD, particularly in patients with biliary stents. Objective To analyze the microbiology of post-PD wound infection cultures and the effectiveness of institution-based perioperative antibiotic protocols. Design, Setting, and Participants The pancreatic resection databases of 3 institutions (designated as institutions A, B, or C) were queried on patients undergoing PD from June 1, 2008, to June 1, 2013, and a total of 1623 patients were identified. Perioperative variables as well as microbiology data for intraoperative bile and postoperative wound cultures were analyzed from June 1, 2008, to June 1, 2013. Main Outcomes and Measures Wound infection microbiology analysis and resistance patterns. Results Of the 1623 patients who underwent PD, 133 with wound infections (8.2%) were identified. The wound infection rate did not differ significantly across the 3 institutions. The predominant perioperative antibiotics used at institutions A, B, and C were cefoxitin sodium, cefazolin sodium with metronidazole, and ampicillin sodium–sulbactam sodium, respectively. Of the 133 wound infections, 89 (67.1%) were deep-tissue infection, occurring at a median of 8 (range, 1-57) days after PD. A total of 53 (40.0%) of the wound infections required home visiting nurse services on discharge, and 73 (29.1%) of all PD readmissions were attributed to wound infection. Preoperative biliary stenting was the strongest predictor of postoperative wound infection (odds ratio, 2.5; 95% CI, 1.58-3.88; P = .03). There was marked institutional variation in the type of microorganisms cultured from both the intraoperative bile and wound infection cultures (Streptococcus pneumoniae, 114 cultures [47.9%] in institution A vs 3 [4.5%] in institution B; P = .001) and wound infection cultures (predominant microorganism in institution A: Enterococcus faecalis, 18 cultures [51.4%]; institution B: Staphylococcus aureus, 8 [43.9%]; and institution C: Escherichia coli, 17 [36.2%], P = .001). Similarly, antibiotic resistance patterns varied (resistance pattern in institution A: cefoxitin, 29 cultures [53.1%]; institution B: ampicillin-sulbactam, 9 [69.2%]; and institution C: penicillin, 32 [72.7%], P < .001). Microorganisms isolated in intraoperative bile cultures were similar to those identified in wound cultures in patients with post-PD wound infections. Conclusions and Relevance The findings of this large-scale, multi-institutional study indicate that intraoperative bile cultures should be routinely obtained in patients who underwent preoperative endoscopic retrograde cholangiopancreatography since the isolated microorganisms closely correlate with those identified on postoperative wound cultures. Institution-specific internal reviews should amend current protocols for antibiotic prophylaxis to reduce the incidence of wound infections following PD. Wound infection after surgery is associated with a prolonged hospital length of stay and increased cost of treatment, imposing a significant economic burden on health care. Kirkland et al1 demonstrated that postoperative wound infection directly contributed to an additional 12 days of hospitalization and direct costs of $5038 per complication. A more contemporary study of the National Inpatient Sample2 database revealed that postoperative wound infection contributed to a total of 406 730 additional days of hospitalization and more than $900 million in excess cost annually. Furthermore, there were 91 613 readmissions as a result of postoperative wound infection, accounting for 521 933 additional hospitalization days and costing an additional $700 million. In an effort to overcome the clinical and financial burden imposed by postoperative wound infections, multiple measures, such as perioperative warming of patients12 and timing of preincisional antibiotic administration,13 have been investigated and proven to be effective. The Surgical Care Improvement Project (SCIP), an independent nonprofit organization that accredits and certifies health care organizations in the United States, was established in 2006 and provided guidelines to reduce wound infections. Adherence to SCIP measures has been endorsed by multiple stakeholders as a valid measure of publicly reported surgical quality. 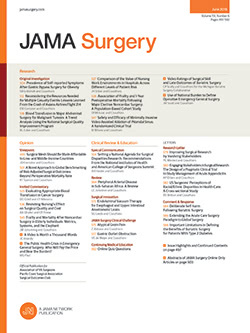 However, recent studies have shown that adherence to SCIP measures did not result in measurable improvement in postoperative wound infections at the patient or hospital level.14-16 In addition, the perioperative antibiotic choices as recommended by the SCIP for “colon/abdominal” surgery may not be appropriate for the PD operation, which involves both intraoperative biliary and enteric contamination.15 The aim of this multi-institutional study was to analyze the results of intraoperative bile and postoperative wound cultures in patients with wound infections after PD and compare them with the findings obtained in patients who received perioperatively administered antibiotics to better understand post-PD wound infections and explore alternative initiatives aiming to improve post-PD wound infection rates beyond the SCIP measures. We queried the pancreatic surgery databases for Massachusetts General Hospital, University of Pennsylvania, and University of Verona for patients who developed a wound infection after PD over a 5-year period (June 1, 2008, to June 1, 2013). The 3 institutions were randomly designated A, B, and C to maintain anonymity. Bile cultures were performed intraoperatively with a sterile cotton swab at the time of bile duct transection. Microbiology data for intraoperative bile cultures were accrued for the 2 institutions that performed them. In patients who developed postoperative wound infection after PD, wound infection culture microbiology data (microorganisms and antibiotic susceptibilities) were also accrued. Intraoperative bile cultures and postoperative wound infection microbiology data were compared to determine the predictive value of bile cultures. The American College of Surgeons National Surgical Quality Improvement Program and research patient data registry databases at Massachusetts General Hospital were linked to the clinical database at that hospital by means of medical record numbers to supplement perioperative data. Wound infection–specific complications and grading were identified and entered into the databases by the institution-specific designated individuals (Z.V.F., M.T.M., and G.M.). This study was approved by the institutional review boards of the Massachusetts General Hospital, University of Pennsylvania, and University of Verona and was compliant with the Health Insurance Portability and Accountability Act. The need for informed consent was waived. Postoperative wound infection was defined according to the standardized American College of Surgeons National Surgical Quality Improvement Program criteria,17 and both superficial and deep wound infections were included irrespective of time from surgery (includes wound infections that develop >30 days after surgery). Superficial wound infection was defined as wound infections that did not require removal of staples, incision, or drainage (superficial cellulitis). Deep wound infections were those that required incision and drainage of pus for resolution of the infection. Organ-space infections were not included in the analysis because they have different risk profiles and should be analyzed separately.18 The American Society of Anesthesiology score and age-adjusted Charlson comorbidity index score19,20 were used to quantify the comorbidity burden of the study cohort. Major vessel resection was defined as the need for resection or reconstruction of the superior mesenteric artery, superior mesenteric vein, portal vein, or hepatic artery. Data are presented as mean (SD), median (interquartile range [IQR]), odds ratio (OR) (95% CI), or number (percentage). Categorical variables were compared using the Fisher exact test or χ2 test. Nonparametric continuous variables were analyzed using the Wilcoxon rank sum test, whereas parametric continuous variables were analyzed with the independent-sample paired t test. The multivariable regression analysis was performed via a PROC LOGISTIC model with a C statistic of greater than 0.6, signifying satisfactory convergence status. All statistics were 2-tailed, and statistical significance was accepted at the P < .05 level. Statistical analyses were performed using Intercooled Stata, version 12.0 (StataCorp). A total of 1623 patients who underwent PD at the 3 institutions were identified. Several differences existed across the hospitals. There were more males at institution C (329 [58.5%] vs 282 [49.0%] and 231 [47.5%] in institutions A and B, respectively; P = .001), and use of corticosteroids was less frequent at institution B (4 [0.8%] vs 9 [3.2%] and 20 [3.6%] at institutions A and C, respectively; P = .01). The proportion of patients with diabetes mellitus was similar between institutions (134 [23.3%] vs 122 [25.2%] vs 122 [21.7%] for institutions A, B, and C, respectively; P = .42). The proportion of patients with American Society of Anesthesiology class greater than 2 was highest at institution B (317 [65.2%] vs 226 [39.3%] and 160 [28.5%] in institutions A and C, respectively; P < .001), but its population’s median (IQR) Charlson comorbidity index score was the lowest (3 [2-4] vs 5 [3-6] and 5 [4-6] at institutions A and C, respectively; P < .001). This finding is in line with a report21 suggesting that there is a major discrepancy in the American Society of Anesthesiology scoring between anesthesiologists. Perioperative factors were discrepant between all 3 institutions as well; institution B had the shortest surgery duration (median [IQR], 277 [244.5-336] minutes vs 328 [279-400] minutes and 380 [335-435] minutes for institution A and C, respectively; P < .001) and the lowest rate of major vessel resection (2.7% vs 11.0% and 8.5% for institutions A and C, respectively; P < .001). Estimated blood loss and the need for transfusion were the lowest at institution C (350 ; P < .001). There was no significant difference in preoperative bilirubin levels between institutions, with the overall cohort having a median (IQR) bilirubin level of 0.7 (3.7) mg/dL (to convert to micromoles per liter, multiply by 17.104). Preoperative biliary stenting was performed more frequently at institution A (371 patients [64.6%] vs 192 [39.5%] and 273 [48.6%] for institutions B and C, respectively; P < .001). Institutions A and B administered periprocedural antibiotics in all patients undergoing endoscopic retrograde cholangiopancreatography, whereas institution C did so in only 160 patients [28.6%] (P < .001). Intraoperative bile culture data were available only for institutions A and C. There was a median (IQR) of 3 (2-4) different species of microorganisms found in intraoperative bile cultures, which was no different between institutions. Intraoperative bacteriobilia was associated with preoperative biliary stenting (98.8% vs 10.5% in patients who did not undergo preoperative biliary stenting; P < .001). Bacteriobilia was also associated with higher rates of postoperative wound infection (12.4% vs 5.3% in patients without bacteriobilia; P = .05). The predominant microorganisms grown from the intraoperative bile cultures at institution A were Enterococcus faecalis (140 cultures [58.8%]), Streptococcus pneumoniae (114 [47.9%]), and Klebsiella pneumoniae (107 [44.8%]). Conversely, the predominant microorganisms grown from intraoperative bile cultures at institution C were E faecalis (30 cultures [44.8%]), K pneumoniae (16 [23.9%]), Enterobacter cloacae (13 [19.4%]), and Escherichia coli (13 [19.4%]); S pneumoniae was present in only 3 (4.5%) of the intraoperative cultures. There was a statistically significant difference in the proportion of E faecalis, S pneumoniae, K pneumoniae, Staphylococcus aureus, and Pseudomonas aeruginosa grown in the intraoperative bile cultures between both institutions (Figure 1). Notably, the overall incidence of Candida albicans in intraoperative bile culture was 12.8% (39 cultures); there was no significant difference between the institutions. The overall wound infection rate was 8.2% and was not significantly different across institutions (P = .52). Of the 133 wound infections, 67% were deep-tissue infection and occurred a median of 8 days (range, 1-57) after PD. Up to 67% of wound infections required home visiting nurse services after discharge, and almost 30% of the infections required readmission. When analyzed by institution, 31 patients (73.8%) with postoperative wound infections at institution A were discharged with visiting nurse assistance (VNA), which was significantly more so than institution B (2 patients [7.5%]) (P < .001) (VNA services not provided at hospital C). Conversely, only 8.7% of patients with postoperative wound infections at institution A required readmission compared with 46.1% and 58.3% at institutions B and C, respectively (Table 1) (P < .001). Logistic regression analysis identified preoperative biliary stenting as the strongest predictor (reported as OR [95% CI]) of postoperative wound infection (2.5 [1.58-3.88]; P < .001), followed by body mass index (1.5 [1.33-1.71]; P = .001) and Charlson comorbidity index (1.2 [1.06-1.39]; P = .05). Most postoperative wound infections were polymicrobial, with a median (IQR) of 3 (2-4) different species cultured. There was marked variation in the type of microorganisms cultured from the wound infection. The predominant microorganisms cultured from postoperative wound infections at institution A were E faecalis (18 cultures [51.4%]) and E cloacae (16 [45.7%]). Conversely, the most common microorganisms at institution B were S aureus (8 cultures [43.9%]) and K pneumoniae (4 [21.4%]), and at institution C, E faecalis and E coli (17 [36.2%] for both). The overall incidence of C albicans in postoperative wound infection cultures was 11.5%, and there was no significant difference between institutions. Significant differences in the predominance of microorganisms are highlighted in Figure 2. The predominant (>95%) perioperative antibiotics used at institutions A, B, and C were cefoxitin sodium, cefazolin sodium–metronidazole, and ampicillin sodium–sulbactam sodium, respectively. Most microorganisms grown from wound cultures at institution A were resistant to ampicillin (55.6%) and cefoxitin (53.1%). Institution B grew microorganisms that were predominantly resistant to ampicillin (69.2%) and cefazolin (42.9%). However, institution C’s microorganisms had a different profile, with most showing resistance toward penicillin (72.7%) and cefoxitin (65.9%). Institution C also had a disproportionately higher resistance rate to cefazolin and methicillin (Table 2). In this study, we report (as OR [95% CI]) a very strong association of preoperative biliary stenting with bacteriobilia (725.3 [155.6-3380.5]; P < .001), which in turn is strongly associated with postoperative wound infection (2.5 [0.583-11.05]; P = .05). Not surprisingly, preoperative biliary stenting was found to be the strongest independent predictor of postoperative wound infection (2.5 [1.58-3.88]; P < .001). In previous studies,29-32 the clinical effect of bacteriobilia found on intraoperative bile culture has demonstrated an association with not just postoperative wound infection but also with organ space infection and sepsis. Despite that finding, intraoperative sampling of bile during PD is not common practice, limiting adequately powered, reproducible analysis that can be generalizable. Our data reveal that bacteriobilia, in line with the literature,29-32 is often polymicrobial. However, to our knowledge, our study is the first to demonstrate heterogeneity in both the practice of intraoperative bile culturing and microorganisms grown between different institutions, suggesting the need for institution-specific internal review. The overall wound infection rate of 8.2% in our study was similar between all 3 institutions and marginally lower than the post-PD wound infection rate reported in the literature.5,22-26 Wound infections have been one of the most common reasons for readmission after PD,33-36 often occurring as a late complication.34 Our analysis demonstrates that 29.1% of post-PD wound infections required a readmission. Although institution A more frequently used VNA services for patients with wound infections on discharge (73.8% vs 7.5% for institution B; P < .001), the proportion of wound infections requiring readmission was proportionately lower (8.7% vs 46.1% and 58.3% for institutions B and C, respectively; P < .001). Although it was not within the scope of the study to perform a cost analysis, one can hypothesize that the liberal use of VNA services represents a potential avenue for decreasing length of stay, cost, the patient’s distress, and hospital outcome measures associated with readmissions. When analyzing wound culture microorganisms, there was marked variation in the microorganisms grown, with equal variation in the antibiotic resistance pattern. More important, none of the 3 institutions analyzed was using effective perioperative antibiotics based on their cultured microorganisms. Institution A mainly administered cefoxitin for perioperative coverage, but the cultures predominantly grew Enterococcus and Enterobacter. There are strains of E faecalis that are cephalosporin resistant, and cefoxitin is largely ineffective in covering Enterobacter. Institution B used cefazolin and metronidazole but had the largest proportion of cultures growing S aureus and K pneumoniae, which were resistant to cefazolin. Finally, institution C used ampicillin-sulbactam; however, more than 60% of their strains of E faecalis and E coli are resistant to that agent. In addition, institution C had the highest incidence of C albicans identified in their wound cultures (15%). Are these findings truly a call for institution-specific internal review for educated selection of antibiotic therapy, or are the findings a reflection of bacterial resistance development as a result of institution-specific perioperative antibiotic coverage? To answer this, we compared intraoperative bile cultures with wound cultures based on institution and found a marked similarity in microorganisms grown from the cultures in institutions A and C (Figure 3). This similarity argues against our findings that bacterial resistance develops in response to institution-specific perioperative antibiotic choice. Conversely, the similarity highlights the importance of obtaining intraoperative bile cultures given their ability to predict the microbial species grown in postoperative wound cultures and guide antibiotic selection in patients with postoperative wound infection. In an early study when patients routinely had indwelling biliary tubes after pancreaticoduodenectomy, Pitt et al29 studied intraoperative bile cultures and compared them with those obtained on postoperative days 4 to 7 in 111 patients; the results indicated a significant alteration in the types of microorganisms isolated. However, the patients in that study were receiving more than 5 days of postoperative antibiotics and, because the biliary drains were external, the cultures might have been confounded by contamination. Our study represents a large cohort with a subanalysis of more than 250 patients showing that the initial intraoperative bile culture determines the microbiology of postoperative wound infection and that subsequent alteration in microorganisms or resistance patterns as a result of perioperative antibiotic therapy, even if present, should hold no bearing. Our data also suggest that the antibiotic regimen recommended by the SCIP for colon/abdominal surgery, which consists primarily of cephalosporins and ampicillin-sulbactam, should be reconsidered for PD given the extensive biliary and enteric intraoperative contamination associated with this surgery and the different infectious risk profile. A UCLA (University of California, Los Angeles) group of investigators recently analyzed wound cultures in 34 patients whose cultures mainly grew cefoxitin-resistant E faecalis and E cloacae (similar to institution A in the present study) and tailored their antibiotic therapy by switching to piperacillin-tazobactam, which reduced their wound infection rates from 32.4% to 6.6%.15 Similar to our findings, most of the microorganisms isolated were also resistant to ampicillin-sulbactam (ie, the other SCIP-approved regimen). A French group has investigated the duration of antibiotic coverage after PD. Sourrouille et al37 performed an exploratory study in which a 5-day course of bile-antibiogram–based antibiotics were administered to high-risk patients (those undergoing preoperative endoscopic procedures) and found reduced rates of urinary tract infections, pulmonary infections, and septicemia but no significant difference in the incidence of wound infection and intra-abdominal abscess compared with the rate in low-risk patients (those who did not undergo endoscopic procedures). The investigators concluded that the postoperative short course of extended antibiotics reduces the overall infectious rate after PD. Although our study was not designed to evaluate an extended course of antibiotics, the significant risk of C difficile infection associated with piperacillin-tazobactam38,39 seems to be excessive when only 12.4% of patients with bacteriobilia developed wound infection compared with those without bacteriobilia (5.3%). Instead of indicating a need for prolonged antibiotic treatment, these data on bile culture microorganisms should guide physicians on informed antibiotics administration in the setting of wound infection without culture data or when culture data are pending. One of the limitations of this study is its retrospective design and consequent difference in patient demographics between the 3 institutions. However, our study focused on the microbiology analysis of intraoperative bile cultures, perioperative antibiotic regimens, and postoperative wound cultures; demographic factors have minimal implications on the final analysis of these variables. In addition, given that institution-specific research assistants were tasked with data collection, information bias may play a confounding role in the capture of wound infection–specific complications between institutions. Among the strengths of this analysis are the granularity and reliability of the data accrued from individual institutions. It has been proven that large administrative data sets (eg, National Surgical Quality Improvement Program and Centers for Disease Control and Prevention’s National Healthcare Safety Network) report incongruent data when analyzing wound infection rates.40-44 In the present study, data used for analysis were personally accrued by coauthors (Z.V.F., M.T.M., and G.M.) at their respective institutions and reviewed for accuracy. Our analysis of data from a large-scale study analyzing post-PD wound infections identified significant interinstitutional variability in intraoperative bile and wound cultures as well as antibiotic resistance patterns. None of the 3 institutions analyzed was using effective antibiotic prophylaxis. We propose that intraoperative bile cultures should be routinely obtained during PD to predict microorganisms isolated in wound cultures and allow for tailored antibiotic therapy in the setting of pending or unavailable wound culture data, especially if there has been preoperative biliary manipulation. The SCIP performance measures and antibiotic regimens recommended for PD should be reevaluated, and institution-specific internal reviews should guide trials before amending current protocols for antibiotic prophylaxis to reduce the incidence of wound infections following PD. Based on the reported microbiology data, our institutions are collaborating on a randomized, double-blind clinical trial evaluating the efficacy of standard-of-care perioperative SCIP regimens vs more aggressive therapy (piperacillin-sulbactam) in our attempt to reduce the incidence of post-PD wound infections. Corresponding Author: Carlos Fernández-del Castillo, MD, Department of Surgery, Massachusetts General Hospital, 15 Parkman St, Boston, MA 02114 (cfernandez@partners.org). Accepted for Publication: September 11, 2015. Published Online: December 23, 2015. doi:10.1001/jamasurg.2015.4510. Author Contributions: Dr Fernández-del Castillo had full access to all the data in the study and takes responsibility for the integrity of the data and the accuracy of the data analysis. Study concept and design: Fong, Malleo, Ferrone, Fernández-del Castillo. Acquisition, analysis, or interpretation of data: Fong, McMillan, Marchegiani, Sahora, Malleo, De Pastena, Loehrer, Lee, Chang, Hutter, Drebin, Bassi, Lillemoe, Vollmer, Fernández-del Castillo. Drafting of the manuscript: Fong, Sahora, De Pastena, Ferrone, Fernández-del Castillo. Critical revision of the manuscript for important intellectual content: Fong, McMillan, Marchegiani, Malleo, Loehrer, Lee, Chang, Hutter, Drebin, Bassi, Lillemoe, Vollmer, Fernández-del Castillo. Statistical analysis: Fong, Sahora, Loehrer. Administrative, technical, or material support: Fong, McMillan, Marchegiani, De Pastena, Lee, Chang, Drebin, Fernández-del Castillo. Study supervision: Fong, Marchegiani, Malleo, Ferrone, Hutter, Bassi, Lillemoe, Fernández-del Castillo.